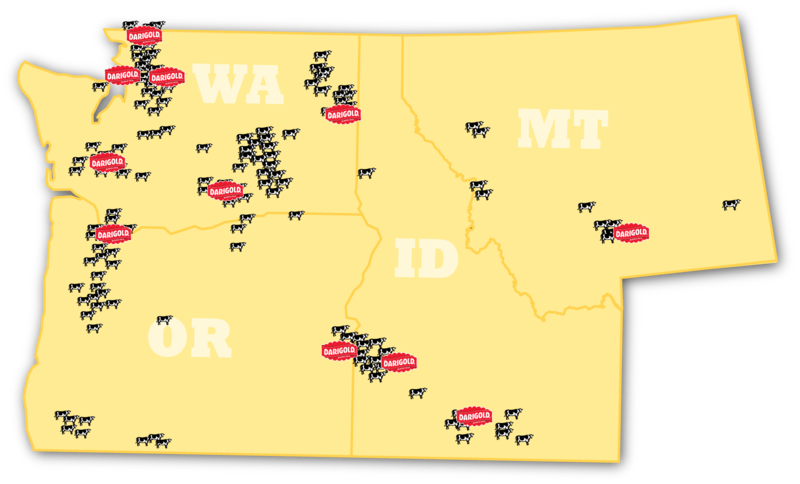 The Northwest Dairy Association (referred to as NDA) is a cooperative with nearly 500 dairy farm members in four Northwestern states (Washington, Oregon, Idaho and Montana). These member farms are both independently owned and independently managed companies by their farmer-owners. Darigold is a subsidiary of NDA for the sole purpose of processing and marketing the milk produced by the NDA member farms. In 1988, Jerry VanDellen returned to the dairy farm he had grown up on in Sumas, Wash., just south of the Canadian border in Whatcom County. After about a decade back on the farm, Jerry and his wife, Michelle, took over the business from his parents and that’s when it became VanDellen Farm. In its initial years under Jerry and Michelle’s ownership, the farm continued to operate as usual, growing at a steady pace. By 2005 the VanDellens had a herd of 500 cows and have continued to operate at this size ever since. Over the years, the VanDellens have been dedicated to continuously improving the operation of their farm. In 2002 and 2005, they took on large building projects that updated the cows’ beds, providing them with a more comfortable space. Constantly dedicated to care of the cows, Jerry and Michelle decided to build another barn in 2015 that provided an additional 120 sleeping stalls. However, with this addition, they did not increase the number of cows in their herd. This was simply to provide the cows with more space and to increase their comfort. The cows responded by producing more milk, a physical reaction correlated with being relaxed and comfortable. While the VanDellens are constantly focused on the health and comfort of their cows, they are also dedicated to their employees, knowing that the farm would not be able to operate without their hard work. For example, one employee, Enrique Mendoza, has worked with Jerry for approximately 15 years, and with Jerry’s help is starting his own dairy farm, Mendoza Dairy. After immigrating to the U.S. from Guatemala, Enrique began working at VanDellen Farm in 2003 as a milker. Throughout his tenure on the farm, Enrique also worked as a feeder and eventually became the manager in 2008. His steadfast interest in farming and loyal dedication to the business was apparent. Jerry often refers to him as a sponge, soaking up all the knowledge he can. In fact, Enrique was so interested in learning more about new topics, that he found a week-long program at a school in Colorado focused on pregnancy and ultrasounds for dairy cows. Though the VanDellens don’t have this particular equipment at their farm and typically outsource this work, they knew it was something Enrique was interested in pursuing. They paid for him to attend the course which enabled him to continue broadening his expertise. The VanDellens recognized the importance of providing Enrique with an opportunity to experience how other farms work. 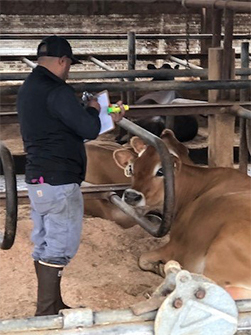 To further reinforce Enrique’s drive to learn more, he dedicated his days off and his early morning hours as a relief breeder for All West Select Sires and others in the area to gain a better understanding of the genetics industry. 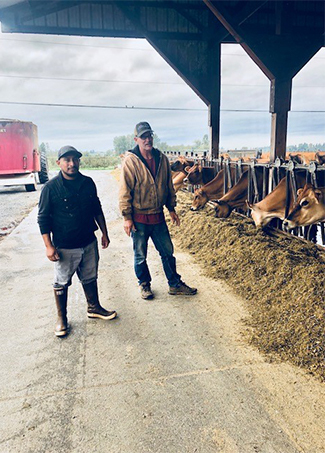 After Enrique had spent nearly a decade working at VanDellen Farm, Jerry asked Enrique what his personal goals were, and Enrique shared with Jerry that he wanted to be a dairy farm owner. The VanDellens worked with Enrique for several years to identify the right facilities to start Enrique’s farm, Mendoza Dairy. In late 2017, an opportunity presented itself and on Jan. 1, 2018, Mendoza Dairy began its operation and joined the Northwest Dairy Association, of which Darigold is a subsidiary. Currently the VanDellens and Enrique own the farm together, but once Mendoza Dairy is more established, the VanDellens plan to step back and Enrique will be the majority owner. In the next five or six years, Jerry plans to assess the future of VanDellen Farm. With three children of his own, he plans to determine if any of them are interested in taking over the family business. If not, he’s said that it’s a possibility that he and his wife will dissolve VanDellen Farm, allowing Mendoza Dairy to take over their facilities and giving Enrique’s business an opportunity to continue growing and thriving. Since its founding, Sunnyside Dairy has dedicated itself to responsible and sustainable farm practices while cultivating a positive working environment for their employees. Located in Sunnyside, Wash., the farm started as a small family business in 1991 and slowly grew to one of the largest dairies in Eastern Washington with two facilities and more than 80 fulltime employees. The farm prides itself on maintaining a team of dedicated individuals that feel more like family than coworkers. While the managers on the farm are dedicated to the care of the cows, they also prioritize creating opportunities for their team members to grow within the company and achieve their personal goals. Rosalio Brambila, general manager at Sunnyside Dairy, began working at the company in 1994 right out of high school. As his first “real” job, Rosalio started by driving tractors and doing general outdoor labor. He enjoyed having a steady income and was happy to complete any task that was asked of him. Over that last 24 years, Rosalio’s admirable work ethic and dedication led to him climbing the ranks within the farm, becoming a supervisor, then eventually earning his current position as general manager. As a first-generation immigrant from Mexico, Rosalio is proud of how far he has come. Originally, he enjoyed his job at Sunnyside Dairy because it provided him the means to support his family. However, the industry and this farm quickly became his passion as he fell in love with the people, the cows, and the intricacy of the equipment. Now, he looks forward to going to work every day and supporting the farm and his team however he can. Rosalio is not the only employee who has had a long tenure at Sunnyside Dairy. Many supervisors have been at the dairy for 15 years or longer, some have even been with the farm since its founding. Rosalio’s impressive team is something he takes great pride in and he credits them with creating such a positive work environment. “If you have a good system and good people, everything else falls into place,” he said. As general manager, Rosalio is now more focused on the people at the farm more than ever before. “We aren’t just working with cows, we are working with people,” said Rosalio. Sunnyside Dairy is very focused on maintaining financial viability to ensure the dairy can continue to provide jobs for the Sunnyside community and opportunities for existing employees. His dedication and appreciation for his team stems from his start on the farm—an opportunity that enabled him to build a long, successful career. 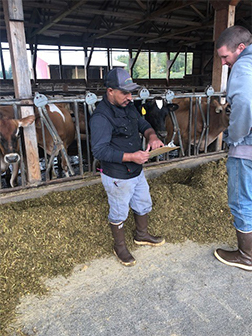 The owners of the dairy made sure to provide him with learning opportunities and gave him exposure to different responsibilities that have served as the foundation of his career. He hopes to do the same for others who come to work on the farm. Over the years, he has been inspired by a number of hard-working individuals that have overcome hardships and broke down barriers, ultimately leading to success in their own careers. He understands that providing the right opportunity for individuals can have lasting impacts on their lives and he feels incredibly fortunate to have come across his opportunity at Sunnyside Dairy nearly 25 years ago. 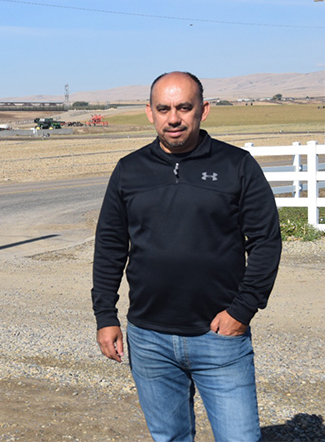 Rosalio believes there is always room to grow and he aspires to make continuous improvements to Sunnyside Dairy as well as identify ways to make an impact on the surrounding community. One of the improvements he hopes to make in the near future is updating the milking facilities to accommodate younger employees with interest in new technologies. In addition, he wants to invest in innovative waste management technology to operate even more sustainably and focus on the stewardship of the land. 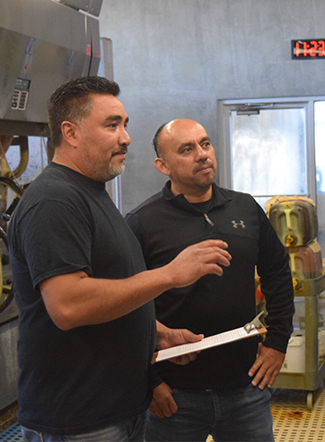 Over the course of his career at Sunnyside Dairy, Rosalio has learned many lessons, but the most important is recognizing that the foundation to any successful business is a strong team. He understands the value of his team and demonstrates his commitment to them by fostering a positive work environment filled with opportunity.